Some dishes take a little chutzpah to pull off. I think large roasts fall in this category. First off, buying a large enough amount of meat to roast usaully cost a lot of money. Secondly, when you make a roast you are usaully making it for a lot of people. This means if you mess it up, lots of people go hungry. These are just a couple of reason I had put off trying to roast a leg of lamb. However I swung by the meat section of Safeway and a boneless prepared leg of lamb stared back at me with a sale sticker on it. You gotta try everything once, right? I am happy to report that it was a very big success. The lamb was tastey, and tender. I was pleasantly suprised. I would recommend giving this a try and also recommend getting a prepared leg if it you first time. Not have trim the leg, remove bone and tie it back up made it all a lot easier. I combined the recipe on the leg with the one from Cook’s Illustrated, New Best Recipes. Mix 2 teaspoons salt, 2 teaspoons pepper, and rosemary in a small bowl. Cut slits into roast with point of paring knife; poke garlic slivers inside. Rub seasoning onto all surfaces of meat, then coat with olive oil. 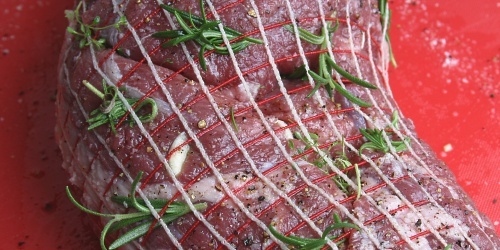 Place leg meat side up on roasting pan fitted with wire or mesh roasting rack; let stand for 30 minutes. Meanwhile, adjust oven rack to lowest position and heat oven to 450 degrees. Pour 1/2 cup of water into the bottom of the roasting pan. Roast lamb for 10 minutes. With a was of paper towels in each hand, turn the leg over. Roast 10 minutes longer. Lower oven temperature to 325 degrees. Again, turn leg meaty-side up and continue rosting, turning leg every 20 minutes until instant-read thermometer, when inserted in several locations, registers 130 to 135 degrees, 60 to 80 minutes longer. Transfer roast to another pan; cover with foil and set aside in a warm spot to complete cooking and allow juices to reabsorb into the tissues, about 15 to 20 minutes. Remove string from roast and carve following illustrations below. Transfer sliced lamb to a warm serving platter with caper sauce passed separately. I’ve made this a few times now and it rocks. Thanks so much. I’m no longer afraid of lamb. I just made this roast last night. WOW. Where has this been all my life? What was I afraid of??? Thanks for the recommendation to get the leg prepared from the butcher. Turned out beautifully and yummy. I served it with the Lemon Parsley Risotto recipe you posted – also amazing! now isn’t this the roast ever? i think lamb, garlic and rosemary are a combination made in heaven.